JOHN ALDUS (Gérald Ducimetière): detail of Ground / Rain / Air (1972). England & Co’s presentation was focused primarily on the avant-garde of the 1960s and 1970s: encompassing artists’ use of photography as a medium and method for documentation and experimentation, with well-known artists exhibited together with new re-discoveries. Howard Selina actively used photography in his land-art works and performative conceptual works of the 1970s. In Seven small coastal events, Brancaster, Norfolk (1974), words related to the location, such as ‘wind’, ‘gull’ or ‘inlet’, were spelt out letter-by-letter in sign language in a series of small black and white photographs. In Imagining and Thinking About (1972), ten self-portrait photographs depict subtle variations of the artist’s face while he imagined and thought about parts of his body. A pair of mounted photographic sequences from 1972 by John Aldus/Gérald Ducimetière poetically documented an elusive performance. In Ground/Rain/Air, the artist lay on the ground while rain fell; when he got up, the shape of his body, left dry against the damp ground, gradually faded as the air evaporated the dampness around it. In another version, Ground/Rain/Rain, the shape of his body was instead gradually erased by rain continuing to fall. Political and subversive themes helped British-based Michael Druks establish an international reputation in the 1960s and 1970s for his highly original conceptual work incorporating performance and photography. Class Sport (1978) is a sequence of his own colour photographs collaged over found printed photographs of polo players from the 1920s. The early work of Sue Barnes explored feminist themes about self-identity, family, and ‘the home’. Barnes is virtually unknown as she disappeared from view in the 1980s and only started to exhibit her work towards the end of her life. Her domestic environment and her own self were her major concerns and themes, and most of her work from the 1970s and early 1980s was produced/photographed within her small south London flat. She worked in photographic series: numerous self-portraits included a series where she photographed herself naked in a bath with a variety of plastic creatures. She also made repeated images of domestic objects and various series of images where the subject is manipulated by cutting, tearing or distortion. Monica Ross worked with video, installation, text and performance, and was a prominent Feminist artist and organizer. In The House of the Dream (c1990s), Ross evoked Walter Benjamin’s dream about Goethe’s house, a dream influenced by Freud’s dream analysis and described in Benjamin’s book One-way Street, published in the 1920s: ‘The hours that hold the figure have run their course within the house of the dream’. 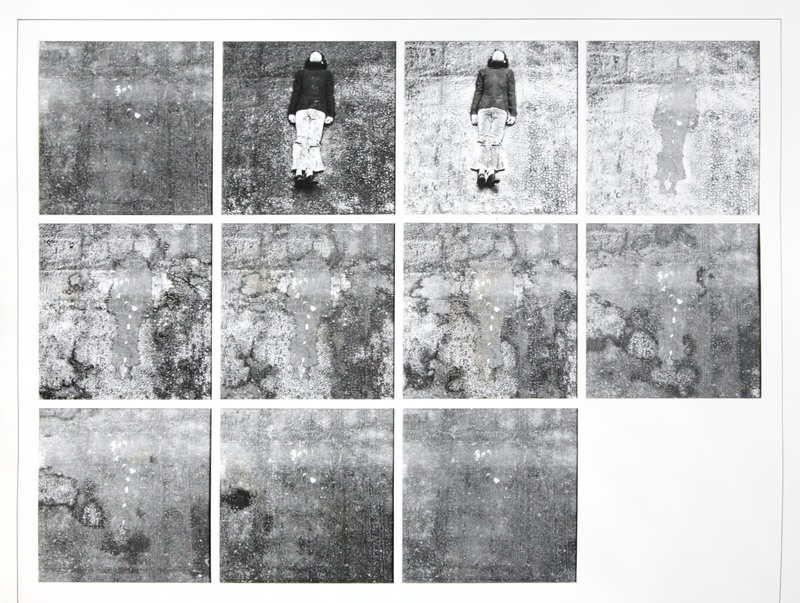 Feminist concepts and concerns also inform the works of artist Anne Bean who uses performance in what an Artscribe article called “a random, protean, art-as-life way” – the images recording these events evoke this elemental quality. Cecilia Vicuña’s ephemeral performance works also exist later as photographic documentation that she has directed and choreographed in a collaborative process. Clay Perry documented London’s avant-garde in the 1960s – from photographing Yoko Ono at her early exhibition at the Lisson Gallery; to Perry being in-house photographer for the experimental Signals Gallery run by David Medalla and Paul Keeler.